Class will be led by Gracie Landes, GNPS member and Yoga instructor. She has generously offered to share her expertise in this class. As someone in that age-group she is interested in working with late middle-aged and older people, to help them maintain a healthy level of activity. Wear comfortable clothing for movement: sweats, dance wear, loose clothing. Class is usually done barefoot, but clean sneakers may be worn. 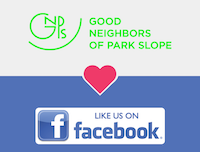 contact goodneighborsofparkslope@gmail.com or the event contact.